When I was about nine years old my parents had something shipped to our house that arrived in a very large box. I was thrilled when they said that I could have the box, which a friend and I turned into a house, complete with windows and a door that could open. We drew pictures on the wall and kept all our 'treasures' in that house for as long as it lasted. That box was a fantastic gift, and on this Picture Book Monday we celebrate boxes in all their wonderful charboardy glory. When an adult looks at a box he or she sees a container something that can be used to store things in, or transport things from one place to another. In short, a box is a tool. A simple object. However, when a child sees a box he or she sees “a strange device” that can be opened many times and that offers up endless possibilities. Ever since cardboard boxes have been around, children have played in them. Often parents, after going to a great deal of trouble to find the perfect gift for their child, find that their little treasure is happy to play with the box that the gift came in. The gift itself lies on the floor, ignored, while the box is turned into a house, a space ship, or a fort. 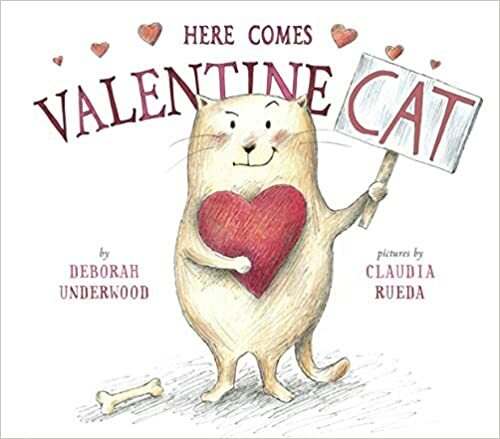 This wonderful book, with its minimal rhyming text and its gorgeous artwork, is a treasure that children will love. Grownups too will enjoy tripping down memory lane as the narrative unfolds, remembering how they too took long journeys and had grand adventures in boxes when they were children. For me going out into nature is a healing, calming thing to do. When everything else seems to be spinning out of control I go up into the hills above my town and spend time amongst the tall trees, the manzanita shrubs, the little wild flowers, the ravens, and the stellar jays. I feel very lucky that I am able to do this, and am quite content to trade the joys of city living for the wilderness. Today's poetry title celebrates nature through poems and beautiful photographs. It is a book for anyone who has looked at a sunset, watched a wild bird. or admired a robust little flower growing up through a crack in the sidewalk. Henry David Thoreau, who famously spent many months in a tiny little building next to a place called Walden Pond, felt that “I have a room all to myself; it is nature.” He knew that the pond and woods just outside his door were places that would give him inspiration and sooth his soul. Amongst the trees and flowers, and in the company of the woodland animals, he found the words that he so needed to share with others. For this collection J. Patrick Lewis, the former U.S. Children’s Poet Laureate, has brought together over 200 poems written in a variety of forms. Some of the poets’ names will be familiar, while others will be new to readers. Some of the poems will be old friends, while others will become new ones. Picture Book Monday with a review of Bear Can Dance! Many of us dream of things that we wish we could do. Some of us are brave enough to pursue these dreams. The problem is that more often than not our expectations and reality don't quite match up, which leads to disappointment. Perhaps our dream just isn't possible after all. Today's picture book explores how a bear's dream - to learn how to fly - turns out to be not as impossible as it first seems, though it does not quite work out the way he imagined it would. One day Bear and Goose fire up the record player and they start dancing. As they dance, Bear tells Goose that he wishes he could fly. Bear would love to “swoop and glide and feel the wind in my fur.” Goose wishes she could help Bear fly but the sad truth of the matter is that bears just aren’t made to fly. The Fox shows up and Fox is convinced that she can show Bear how to fly. She gives Bear her cape and goggles and she tells Bear to “flap, flap, flap, and whoosh around.” Bear does as he is told, but instead of feeling “whooshy” Bear feels “woozy,” which is not the same thing at all. The three friends then try sliding down a hill on the snow at full speed but instead of feeling “swoopy,” Bear feels “wobbly.” It would appear that bears really cannot fly after all. In this clever, thoughtful, and delightfully sweet picture book, we see how sometimes the dreams we have, the ones that seem impossible, are actually not as impossible as they seem. The problem is that we can’t see them for what they are because they are not exactly as we envisioned them to be. Sometimes we have to open our eyes, use our imagination, and then we see that yes, the dream we have been seeking is right there. It has always been right there. I have reviewed several books that explore collective nouns, and all of them have been interesting. What makes today's poetry book special is that the collective noun words presented to the reader are packaged with wonderful verse that is peppered with clever, and often amusing, word play. I have the privilege of knowing a lot of people who have jumped into the unknown to pursue their dreams. It is wonderful to see their ideas come to life as they open up shops and businesses that are an extension of themselves. It takes courage to go after a dream, to dare to do something that perhaps other people tell you cannot be done. In today's picture book you will meet just such a dreamer. Peddles the pig wants more out of life, and he dreams of doing things that 'normal' pigs never even consider doing. Peddles is a pig who lives on a farm with lots of other pigs, all of whom do the kinds of things you would expect farm pigs to do. They eat from a trough, oink and root, sleep and well…you get the idea. Peddles is not like the other pigs. Though he ponders the same things that his pig friends think about, he thinks about them “differently.” He thinks about pizza instead of slop, and bathtubs instead of a mud puddle. He has ideas about what it would be like if he could fly like a bird or jump like a frog. Peddles even dares to imagine what it would be like if he could go out into space. The other pigs think that Peddles’ dreams and ideas are ridiculous, and they advise him to “Get your head out of the clouds.” The thing is that Peddles cannot change who he is, and so he goes on having ideas and dreams, though none of them come to anything, which is rather disheartening. Then, one night, Peddles sees a gathering of people in the barn and they are dancing, stomping their cowboy boots, and “twirling and whirling.” Peddles has an idea. A marvelous idea, and maybe this time it will be an idea that turns into something wonderful. In this charming picture book, children will meet a superlative pig, a pig who has big aspirations. Unfortunately, he lives in a world where pigs are not supposed to want more out of their lives. They are supposed to be content with being ordinary pigs. Children are going to love seeing how Peddles pursues a dream, and how his determination and hope affects the pigs around him and thus brings about a very real change. For me music and my memories are closely intertwined. For example, I associate certain pieces of classical music with the hours that my father and I used to spend together because those pieces were often playing on the record player. Certain albums remind me summers when I listened to the albums over and over again. For me certain pieces of music or songs are also tied to dance, and every week I add to my dance memory library when I go to dance with the women in my hula group. In today's poetry title we see how memories are tied to music and dance in other people's lives. We visit a music shop where the patrons tell us stories that are vibrant with music and the sound of dancing feet. 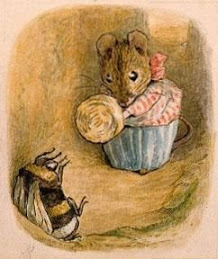 A mouse is sitting, by itself, feeling lonely and bored. He starts picking at the paper he is sitting on and when the tear in the paper gets big enough, he peers through the hole it has created. There is something wonderful and amazing on the other side of the paper and the mouse jumps for joy. In this delightful wordless book, one of Monique Felix’s little mice finds a wonderful surprise behind a piece of paper, a surprise that inspires the lovelorn mouse to get creative. We all tend to label people, even when we try not to, and often the labels come with a certain amount of judgement. All too often our preconceptions of people are way off the mark, and sometimes they are unkind and hurtful as well. In today's picture book we see how the labels we like to put on people are a waste of time and counterproductive. All that really matters are the relationships that we build together. One rainy day Buddy is feeling “bored and a little lonely.” Thankfully, his person, Meredith, comes into the room where Buddy is sitting and life gets interesting again. Meredith is carrying a box, which she puts on the floor. She tells Buddy to “stay,” but the dog, after scratching an itch, forgets all about the command he was given and he goes over to the box to investigate. Inside the box there is a strange prickly thing, which Buddy sniffs and sniffs. He considers licking the thing but decides that this might not be such a good thing to do. Then the thing begins to snuffle and hiss. Buddy is thrilled. The brown, prickly thing is alive! Buddy introduces himself and the thing says that he is called Earl. Earl then proceeds to tell Buddy that he is a racecar, a giraffe, a sea urchin, and a talking hairbrush. Buddy knows full that that Earl isn’t any of these things and he points out why Earl cannot be a car, a giraffe or a sea urchin. After this rather peculiar discussion, Earl then decides to try and guess what Buddy is. 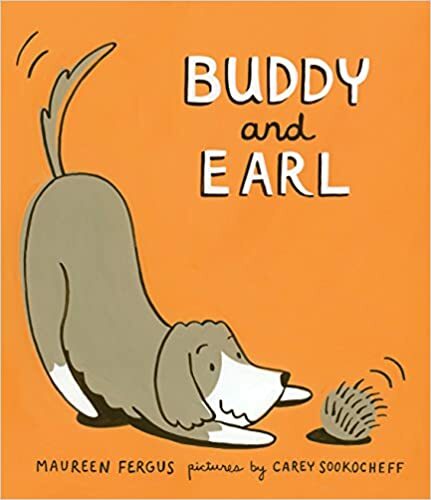 He is convinced that Buddy is a pirate, and before logical Buddy can explain that he is a dog and not a pirate at all, he and Earl are having a wonderful adventure on the high seas. This wonderful book explores the nature of friendship, and it also looks at how important it is to connect with others in a meaningful way that sets asides labels. Children and adults alike will be touched when they see that Buddy eventually figures out who Earl is. It turns out that what really matters is not what you are, but who you are.